Harnessing Nanoscale Surface Interactions: Contemporary Synthesis, Applications and Theory provides coverage of contemporary theoretical and experimental approaches to understanding the interactions of molecules with nanomaterial surfaces and how to utilize these processes for improved synthesis and application of materials. The book reviews recently developed theoretical techniques to explore bonding interactions in nanoclusters and small molecules, along with modern molecular dynamics approaches for investigation adsorption of large molecules on nanomaterials. Novel experimental approaches are described that provide improved control of the synthesis of metal nanoparticles and measurement of their absorption properties. The potential for nanomaterials to address a range of environmental problems is also demonstrated by a selection of specific applications. 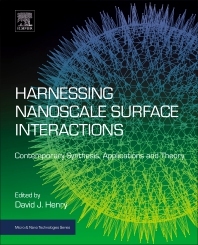 Chapters discuss experimental synthesis approaches, experimental analysis and applications, and theoretical approaches for harnessing nanoscale surface interactions. Dr. Henry’s expertise is in the area of physical chemistry, materials simulation, and computational chemistry and involves applying an extensive range of methodologies including electronic first principles and force field/classical methods to chemical, biological, and materials related problems. At Murdoch University, Dr. Henry teaches Physical Chemistry, Organic and Biological Chemistry, and Materials Chemistry. He leads a group that applies computational and theoretical methods to design gallium-based nanocatalysts and investigate the stability and reactivity of metal complexes under physiological conditions.